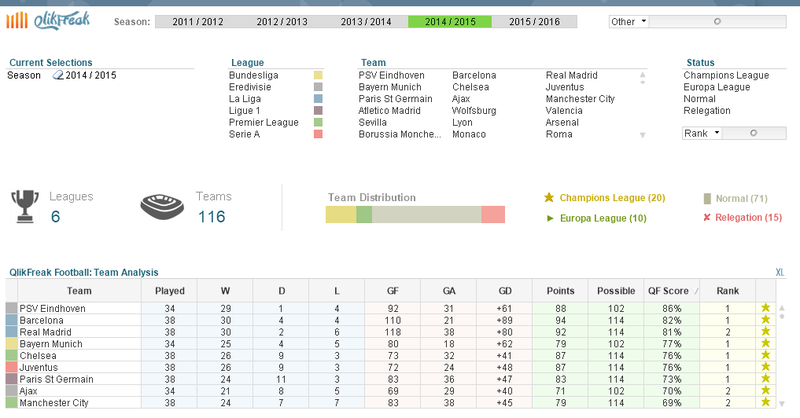 What happens when you mix QlikView with the best football leagues in the globe? In today’s post, I’ll share a little app I created to analyze data about my favorite soccer tournaments like the English Premier League, the German Bundesliga or the Serie A from Italy. So let’s take a break of business oriented dashboards and spend some time reviewing the wins, losses and goals of the last few years. If you’re a football fan, you’ll stay for the discoveries. If you’re a QlikView enthusiast, you’ll stay for the tips regarding scripting and visualization. If you’re not neither of those, you’ll visit our Random page in order to see funny videos like a pug playing ‘Enter Sandman’ from Metallica in the drums. As usual, you can download all the related files here. Ready? Let’s get started! The first challenge in this endeavor was to find a good data source. However, a static XLS file wouldn’t do the trick. Since we’re in the middle of the season and there are matches every week, we need a way to update our file constantly. Even though it’s not the most common way to extract tables, don’t forget that QlikView can retrieve records from external websites (Data from Files > Web Files).